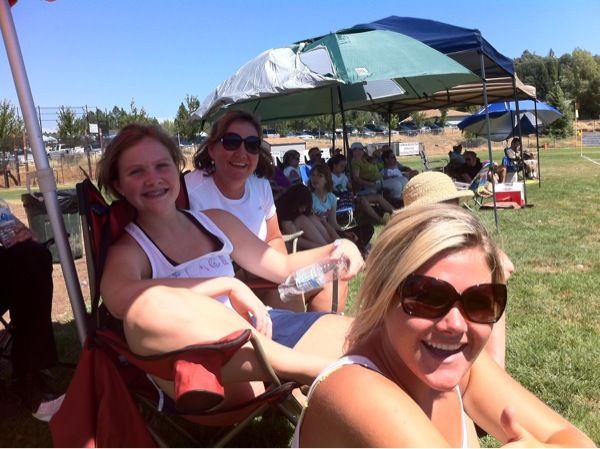 Some of the cheering committee: Aunt Beck, Rach & Brit! In any game below the high school, cheering is permitted. My cousin did tell us she'd rather us be quiet though! Sitting in the shade, you will be soaked in sweat. I can't imagine running in 90 degree heat! The goalie is the only person who can touch the ball with their hands. If a player gets hurt, the whistle is blown and all the players are supposed to take a knee (get low) so the coaches can see who got hurt. Soccer moms are very selfless people. They drive far away, lug around chairs, snacks, go to the bathroom in Porto-potties, volunteer in snack shacks, cheer wildly, and endure crazy weather to support their kids. I learned my aunt is even more awesome than I had thought!